The 2019 NHL Stanley Cup playoffs begin next week on Tuesday, April 9th 2019. 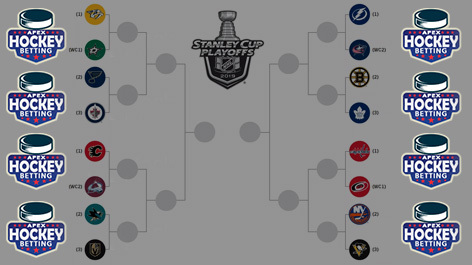 In this guide, I’m going to explain some of the types of bets you can place online during the playoffs and I’ll also predict which team will win the 2019 Stanley Cup. Betting on single games remains popular in the playoffs. Handicappers can wager on the money line, over/under, puckline, team totals and plenty of game props. However, futures betting is also popular, including conference futures and Stanley Cup futures. One of the best bets during the NHL playoffs is series betting. With series betting, you’ll have to pick which team you predict will win the series. One wager will give you action on the entire series and handicapping a series is less difficult than a single game. The best NHL betting sites will also offer betting markets on how many games a series will go and the exact series result. For example, in the Bruins vs. Maple Leafs series you could wager on the Maple Leafs winning the series 4-2 (6 Games) and it will payout a lot more than if you were to simply wager on the Leafs winning the series. Let’s take a look at where the value is when betting on the NHL playoffs this season. At this point in the year, it’s better value targeting lower seeds if you bet futures. Any team can get hot in April and make a Stanley Cup run. Look no further than last season when the Las Vegas Golden Knights made it to the Cup in their inaugural season. Tampa Bay (+180) are overwhelming favorites to win the 2019 Stanley Cup, but would you bet on them at less than 2/1 with the recent playoff troubles they’ve had? I know I’m not interested in the Lightning at those odds, despite being the #1 seed. I’ll be looking at the Pittsburgh Penguins (+1500) and St. Louis Blues (+1200). The Blues are one of the hottest teams heading into the playoffs and the Western conference is wide open, as the division leaders (Winnipeg and Calgary) both lack playoff experience. The experience factor is also why the Penguins are intriguing at 15/1 in the East. The winner of the Maple Leafs (+1700) and Boston Bruins (+900) series will also be a tough out in the East. The Leafs have added firepower up front in John Tavares this season and he has scored 47 goals with two regular season games remaining. However, out of the playoff teams in the East, the Maple Leafs have allowed the second most goals. When betting on single games in the NHL playoffs there’s often value targeting the road team, as they’re typically underdogs even if they’re the better team. In last year’s playoffs, road teams won 52.4% of the games, so home ice advantage wasn’t a factor. Top Sportsbooks – Want to find a great sportsbook specifically for hockey? With the increased scoring across the league, most games will have an over/under line of 6 goals. Last year there was an average of 6.02 GPG in the playoffs compared to 5.94 GPG during the regular season, however, I typically look to target unders this time of the year, as there’s often value on the under 6 goals when defenses tighten up. So, who am I going to pick to win this year’s NHL Stanley Cup? I’m betting on the Blues at 12/1. St. Louis looked like they weren’t even going to make the playoffs at certain points this season, but they’ve come on hot late. The West looks to be easier to advance in than the East this year too. If Jordan Binnington and Jake Allen can both play well in the playoffs, the lack of firepower upfront won’t hurt the Blues. NHL betting always heats up in April and won’t let up until one team wins the Cup at the end of May or early June. Remember to avoid big favorites in the NHL playoffs and try to stick to underdogs when betting on the money line. If you strictly bet underdogs in the single game markets you don’t even need to hit 50% of your bets to turn a profit.